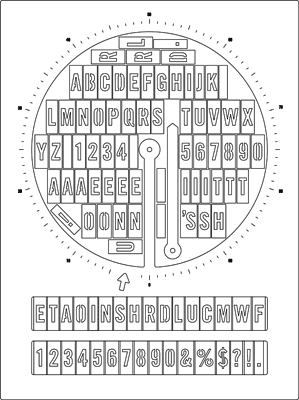 I designed an adjustable lasercut stencil, suitable for the rapid deployment of pie-chart infographics. The design comes with a set of re-arrangeable letters. Changing the message and percentage is straightforward. 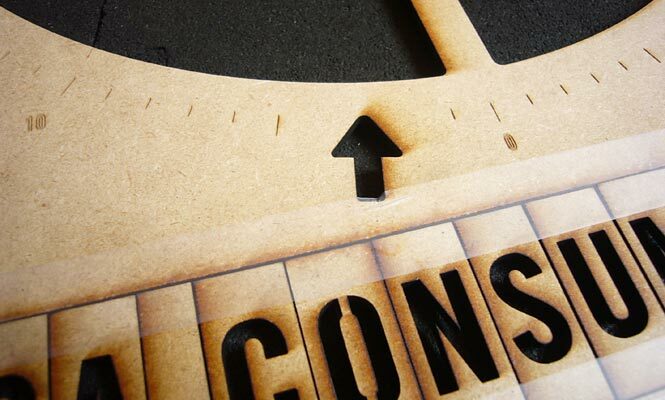 The letters are designed to be held in place with adhesive tape. The pie chart pointer is held in place by an adjustable-tension bolt and wing-nut. A small cutout arrow indicates which portion of the statistic is being described by your text. The perimeter of the pie chart is etched with 100 tick-marks, making it easy to adjust its percentage. The letters (a new stencilized version of Trade Gothic) preserve correct character widths and are provided in proportion to letter frequency (e.g. ETAOIN SHRDLU). 1/8″ (3mm) thick sheet material, suitable for lasercutting. I used MDF, but acrylic is fine. A one-inch 1/4″-20 bolt, wing-nut and suitable pair of washers. I’ve written an article (“Some thoughts on infographic street art“), in response to interview questions by Nicola Bozzi and Suzanne LaBarre, explaining some of my thinking behind this project. Photographs for this project are available in high resolution in this Flickr photoset. Aw, Jean. “Infoviz Graffiti: DIY Pie Chart Stenciling”. Notcot, 6/11/2011. Bozzi, Nicole. “Golan Levin’s Infoviz Graffiti, or Communicating Dissent In a Short Attention Span World”. Owni.eu, 6/23/2011. LaBarre, Suzanne. “Infographiti: Golan Levin Brings Data Viz To The Street”. FastCompany Design, 6/16/2011. Stone, Zak. 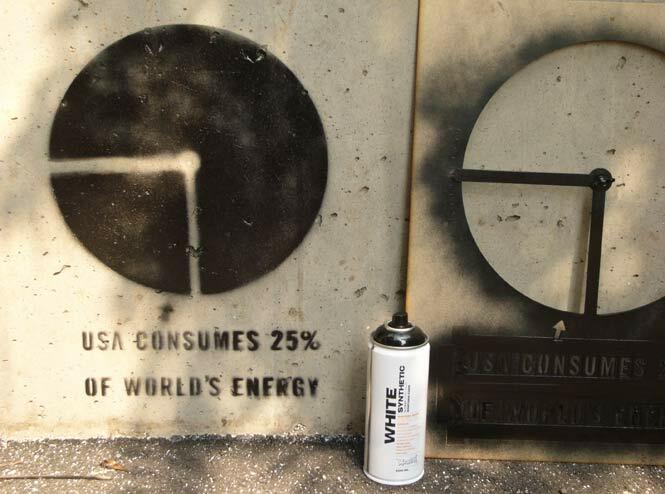 “Customizable Stencil Lets Anyone Make Street Art Infographics”. GOOD Design, 6/15/2011. Van de Moere, Andrew. “Infovis Graffiti: Spray Painting Infographics in the Wild”. Infosthetics.com, 6/10/2011. USA consumes 25% of the worlds’ energy. Women earn 77% per dollar of men. Ocean life depleted 90% since 1950. This 4-hour Speed Project was supported by the STUDIO for Creative Inquiry at CMU. Thanks to Asa Foster III for production assistance, and to Nicola Bozzi and Suzanne LaBarre for their provocative interview questions. Infoviz Graffiti Adustable Pie Chart Stencil by Golan Levin is licensed under a Creative Commons Attribution-NonCommercial-ShareAlike 3.0 Unported License. infoviz, infovis, infographics, information graphics, data visualization, information visualization, dataviz bombing, viz graffiti, grafitti, graffiti research, graf technology, street art, tactical media, contextual infosthetics, urban messaging, locative infographics, situated visualization, chart junk, pie chart stencil, adjustable pie chart, piechart, lasercut, laser cutter, digital fabrication, template, stencil, spray paint, spraypaint, speed project, fffffat lab. Contents © 2009 Golan Levin and Collaborators. "We fling flongs all day long"